Strange bullwhip made from grey suede, with a simply sewn handle of same material. The core just continues into the fall, first slit-braided, then continuing as a single strand. The slit-braided part resembles a dog whip. The end of the 8plt overlay, which is single diamond instead of herringbone pattern, is simply secured with a wire whipping. 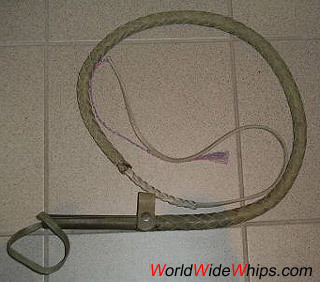 An integrated holder in front of the handle keeps the whip coiled.